Digital Intelligence leader New Relic, Inc. (NYSE: NEWR) today announced financial results for the second fiscal quarter ended September 30, 2016. Revenue of $63.4 million, up 48% compared to the second quarter of fiscal 2016 and 8% from the first quarter of fiscal 2017. GAAP loss from operations was $14.3 million for the second quarter of fiscal 2017, compared to $15.0 million for the second quarter of fiscal 2016. Non-GAAP loss from operations was $4.9 million for the second quarter of fiscal 2017, compared to $8.4 million for the second quarter of fiscal 2016. GAAP net loss per share was $0.28 for the second quarter of fiscal 2017 based on 51.3 million weighted-average shares outstanding, compared to $0.31 for the second quarter of fiscal 2016 based on 48.2 million weighted-average shares outstanding. Non-GAAP net loss per share was $0.09 for the second quarter of fiscal 2017, compared to $0.17 for the second quarter of fiscal 2016. Cash, cash equivalents and short-term investments were $197.3 million at the end of the second quarter of fiscal 2017, compared to $196.1 million at the end of the first quarter of fiscal 2017. Paid Business Accounts as of September 30, 2016 of 14,538. Dollar-Based Net Expansion Rate for the second quarter of fiscal 2017 of 116%. New or expanded customers in the second quarter of fiscal 2017 included: Absa, B2W Companhia Digital, BabyCenter, Canadian Agriculture Lender, CARFAX, Casper Sleep, Cisco Systems, Credit Sense Australia, Domino’s Pizza Enterprises Ltd, GIPHY, Hearst, HubSpot, Hyatt Corporation, Interactive Intelligence Group, Ola Cabs, MEC (Mountain Equipment Co-op), News Corp, Nissan Motor Co., Ocado Group PLC, PennymacUSA, ReachLocal, Stitch Fix, Swiss Federal Railway (SBB), VF Corp., Vistaprint and Wix.com. Launched new cloud pricing option to help customers expand and standardize their monitoring coverage across their applications running on cloud infrastructure. Unveiled New Relic Infrastructure, a new monitoring solution designed to provide deep, real-time visibility into a company’s dynamic cloud and hybrid infrastructure and integrate seamlessly with New Relic’s application performance solutions. Named as the fourth largest application performance monitoring (APM) vendor by revenue according to Gartner’s “Market Share Analysis: Performance Monitoring, Worldwide, 2015,” increasing four spots from the prior year. New Relic is initiating its outlook for its third quarter of fiscal 2017, as well as updating its outlook for the full fiscal year 2017. New Relic has not reconciled its expectations as to non-GAAP loss from operations or non-GAAP net loss per share to their most directly comparable GAAP measure because certain items, namely stock-based compensation, lawsuit litigation expenses and employer payroll taxes on equity incentive plans, are out of New Relic’s control or cannot be reasonably predicted. Accordingly, reconciliation is not available without unreasonable effort, although it is important to note that these factors could be material to New Relic’s results computed in accordance with GAAP. Revenue between $65.5 million and $66.5 million, representing year-over-year growth of between 37% and 39%. Non-GAAP loss from operations of between $7.2 million and $8.2 million. Non-GAAP net loss per share of between $0.14 and $0.16. This assumes 52.4 million weighted average common shares outstanding. Revenue between $255.0 million and $258.0 million, representing year-over-year growth of between 41% and 42%. 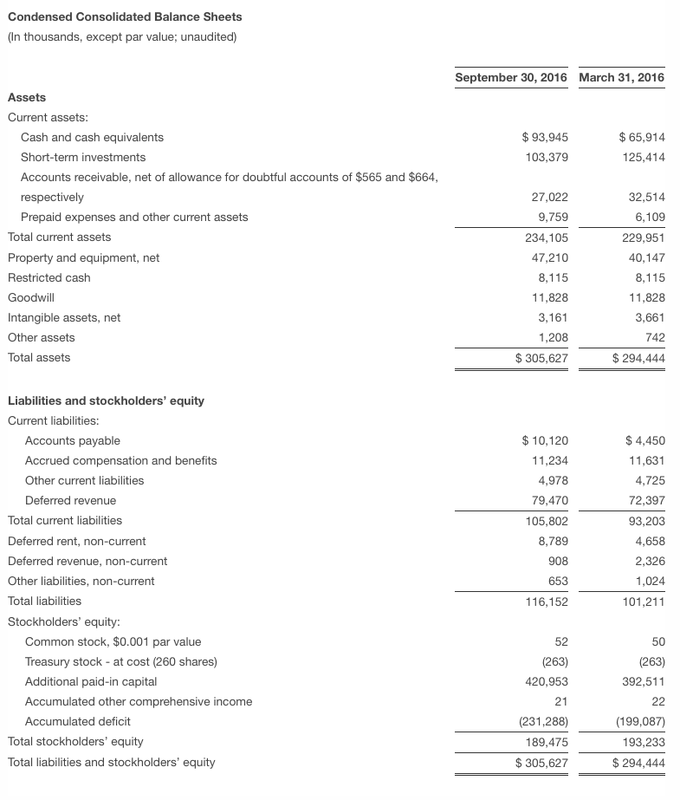 Non-GAAP loss from operations of between $30.5 million and $32.5 million. Non-GAAP net loss per share of between $0.58 and $0.62. This assumes 52.2 million non-GAAP weighted average common shares outstanding. Dial in: To access the call in the U.S., please dial (866) 393-4306, and for international callers, please dial (734) 385-2616. Callers may provide confirmation number 96289804 to access the call more quickly, and are encouraged to dial into the call 10 to 15 minutes prior to the start to prevent any delay in joining. Replay: Following the completion of the call through 11:59 PM Eastern Time on November 14, 2016, a telephone replay will be available by dialing (855) 859-2056 from the United States or (404) 537-3406 internationally with conference ID 96289804. This press release and the earnings call referencing this press release contain “forward-looking” statements, as that term is defined under the federal securities laws, including but not limited to statements regarding New Relic’s future financial performance, including its outlook on financial results for the third quarter of fiscal 2017 and for the full year of fiscal 2017, such as revenue, non-GAAP operating loss, non-GAAP net loss per share, non-GAAP operating income, cash from operations, free cash flow, and capital expenditures, New Relic’s ability and timing to achieve Non-GAAP operating income break-even and positive free cash flow, market trends and opportunity, potential seasonality, New Relic’s customer adoption, momentum, competitive advantages, and value proposition to its customers, the increase in mainstream and larger customers and transaction sizes as well as opportunity for further sales to existing customers, the timing of the general availability release of the New Relic Infrastructure offering, product offerings and pricing plans related thereto, demand therefor, and the timing of potential new revenue and additional benefits therefrom, the timing and matters covered at New Relic’s Investor Day, the potential use and benefits from machine learning, New Relic’s pipeline as well as any revenue benefits therefrom, resource dedication with respect to international opportunities, the effect of New Relic Essentials and cloud pricing, and changes to New Relic’s deferred revenue and overall invoice duration. These forward-looking statements are based on New Relic’s current assumptions, expectations and beliefs and are subject to substantial risks, uncertainties, assumptions and changes in circumstances that may cause New Relic’s actual results, performance or achievements to differ materially from those expressed or implied in any forward-looking statement. The risks and uncertainties referred to above include, but are not limited to, New Relic's ability to generate sufficient revenue to achieve and sustain profitability, particularly in light of its significant ongoing expenses; New Relic's short operating history in an evolving industry; New Relic’s ability to manage its significant recent growth; fluctuation of New Relic’s quarterly results; the development of the overall market for SaaS business software; the dependence of New Relic’s business on its customers purchasing additional subscriptions and products from it and renewing their subscriptions; New Relic’s ability to develop enhancements to its products, increase adoption and usage of its products and introduce new products that achieve market acceptance; New Relic’s ability to persuade New Relic’s customers to expand their use of New Relic’s products to additional use cases; New Relic’s ability to determine optimal prices for its products; New Relic’s ability to expand its marketing and sales capabilities and increase sales of its solutions to large enterprises while mitigating the risks associated with serving such customers; privacy concerns, which could result in additional cost and liability to New Relic or inhibit sales; changes in privacy laws, regulations and standards; New Relic’s ability to effectively compete in the intensely competitive market for application performance monitoring solutions and respond effectively to rapidly changing technology, evolving industry standards and changing customer needs, requirements or preferences; New Relic’s dependence on lead generation strategies to drive sales and revenue; interruptions or performance problems associated with New Relic’s technology and infrastructure; defects or disruptions in New Relic’s products; the expense and complexity of New Relic’s ongoing and planned investments in data center hosting facilities; risks associated with international operations; New Relic’s ability to protect its intellectual property rights; and other “Risk Factors” set forth in New Relic’s most recent filings with the Securities and Exchange Commission (the “SEC”). Further information on these and other factors that could affect New Relic’s financial results and the forward-looking statements in this press release is included in the filings New Relic makes with the SEC from time to time, particularly under the captions “Risk Factors” and “Management’s Discussion and Analysis of Financial Condition and Results of Operations,” including New Relic’s Quarterly Report on Form 10-Q for the fiscal quarter ended June 30, 2016. Copies of these documents may be obtained by visiting New Relic’s Investor Relations website at http://ir.newrelic.com or the SEC's website at www.sec.gov. 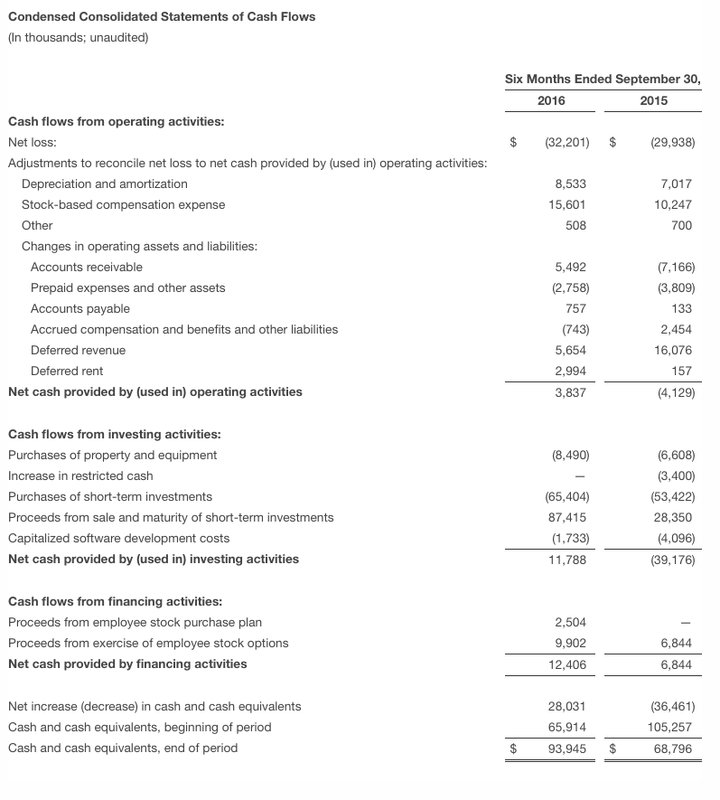 New Relic discloses the following non-GAAP financial measures in this release and the earnings call referencing this press release: non-GAAP loss from operations, non-GAAP net loss, non-GAAP gross profit, non-GAAP gross margin, non-GAAP operating margin, non-GAAP sales and marketing, non-GAAP research and development, non-GAAP general and administrative, non-GAAP net loss per share and free cash flow. New Relic uses each of these non-GAAP financial measures internally to understand and compare operating results across accounting periods, for internal budgeting and forecasting purposes, for short- and long-term operating plans, and to evaluate New Relic’s financial performance. 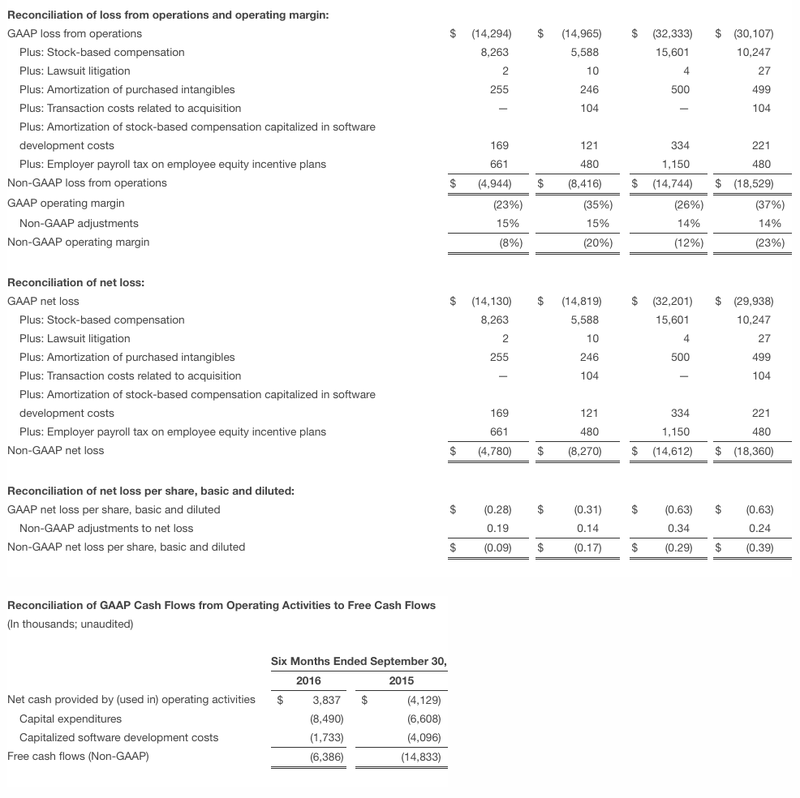 New Relic believes they are useful to investors, as a supplement to GAAP measures, in evaluating its operational performance, as further discussed below. New Relic’s non-GAAP financial measures may not provide information that is directly comparable to that provided by other companies in its industry, as other companies in its industry may calculate non-GAAP financial results differently, particularly related to non-recurring, unusual items. 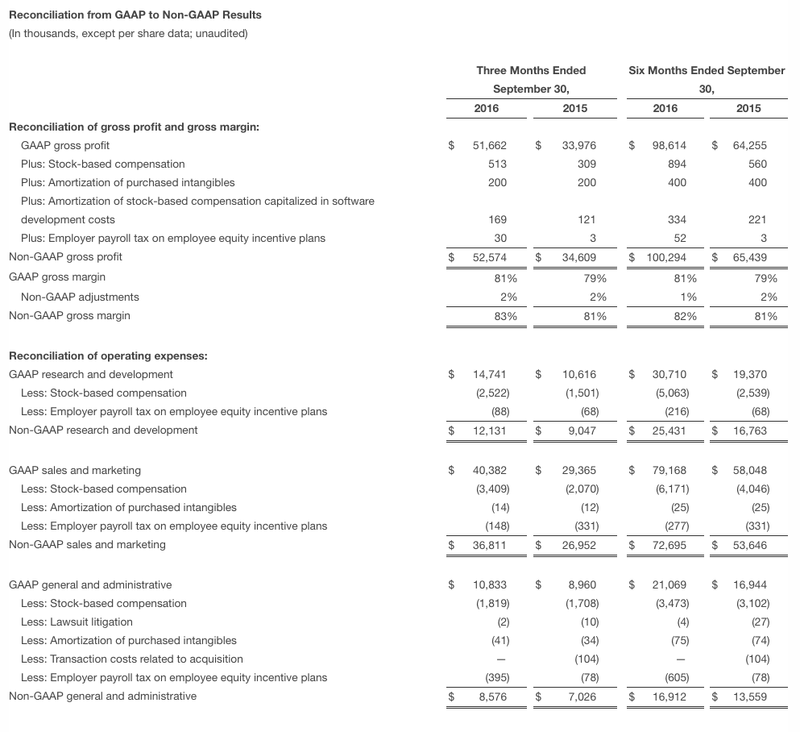 In addition, there are limitations in using non-GAAP financial measures because the non-GAAP financial measures are not prepared in accordance with GAAP and may be different from non-GAAP financial measures used by other companies and exclude expenses that may have a material impact on New Relic’s reported financial results. Lawsuit litigation expense. New Relic may from time to time incur charges or benefits that are outside of the ordinary course of New Relic’s business related to litigation. New Relic believes it is useful to exclude such charges or benefits because it does not consider such amounts to be part of the ongoing operation of New Relic's business and because of the singular nature of the claims underlying the matter. Employer payroll tax expense on equity incentive plans. New Relic excludes employer payroll tax expense on equity incentive plans as these expenses are tied to the exercise or vesting of underlying equity awards and the price of New Relic's common stock at the time of vesting or exercise. As a result, these taxes may vary in any particular period independent of the financial and operating performance of New Relic’s business. New Relic's monthly recurring revenue represents the revenue that New Relic would contractually expect to receive from those customers over the following month, without any increase or reduction in any of their subscriptions.